George and his friends are in the middle of ragging two junior girls in their college. Suddenly George calls a young girl in a sari towards him. With long tresses, a face devoid of makeup and a gentle, curious smile, she walks towards them and introduces herself— “I am Malar. Nan student kadayathu. I am a guest lecturer.” The jaws of George and his friends, and the audience, drop in unison. She literally walks away with the film. 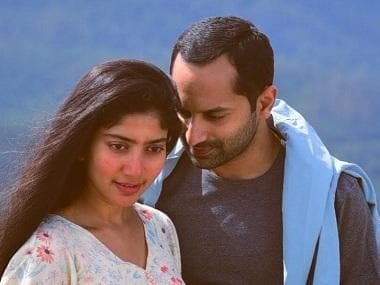 Ever since, Sai Pallavi has been a delicate charming memory for the Malayali audience. Be it her impromptu dappan koothu or her cutesy romance with George in Premam, it’s the most avant-garde presentation of a heroine in Malayalam cinema in a long time. Director Alphonse Putharen did what many from his tribe would have balked at—he made her look stunningly alive and tangible on screen. He celebrated her simplicity, freckle stained cheeks, wind-blown frizzy hair, shy smile and made us fall irrevocably in love with her. You have talked about how the language has posed a problem and therefore you decided to be choosy in Malayalam. What changed with Athiran? The role was interesting, something different from a lot of scripts that came my way. I did tell the director (Vivek) to count me in if there are very few dialogues. I didn’t want to sound foreign if I am playing a Malayali. Thankfully, this had very few dialogues. Also, it was an experience to watch Fahad Faasil transform into his character. He is a switch on and switch off actor. Honestly, it depends on my state of mind. I have made a few surprising choices in the past in which I have wondered whether the stable Pallavi will be comfortable doing a lot of things. When I saw it on screen, I wondered how I got there, irrespective of whether it was a good or bad film. I should either influence the plot or I should be the plot. It’s important for good stories to be told and if I see myself in that character, then great. I haven’t given it a lot of thought. I like knowing what my character does and I try to do a bit of rehearsals at home. But when I reach the sets, I become a totally different person. I don’t know if that homework helps. I sometimes surprise myself by giving something more. Over a period of time, you discover something about that character, add more nuances to it and grow with it. From Premam to Athiran, how do you see your progression? It still hasn’t sunk in, to be very honest. It’s weird because for me, it’s similar to going to college — study and home and here films and home. It’s like being a kid at a toy shop. Every time it’s like the first time, new character, new team, new story. I don’t know if I have grown over a period of time. In Premam, when I was told to focus, I didn’t know what that meant. I didn’t know the basics. Then I saw the other actors, realised I shouldn’t move or focus on my actors. Compared to that, yes, I have improved. You played the wife of a man with anger management issues in Kali (2016). People still talk about the scene where you were being chased by a lorry driver. That fear looked so real. Was it a difficult role to essay? My only thought was 'what if this guy really molests me?' And that was enough to not act and just put my fears out there. It did take a toll on me and I took a while to come out of it. Even after Athiran, I carried a few traits of that character with me. I had to do 60 takes in Selvaraghavan’s film, break open all my fears and stare at this raw, naked Pallavi. That was difficult. I had never seen him until 'Rowdy Baby' happened. Since I got eliminated in the semi-finals, I never saw him. I was 16 then and 10 years later you have the Prabhu Deva choreographing you and it has to be surreal. Everything happens for a reason. I don’t think I would have been this happy, if I had reached the the semi-finals. Now I am in a better space, position and he is choreographing me, all my feelings suddenly matter. You bet! After rehearsing for three days, when we reached the sets to shoot, he suggested we improvise. We had to learn and unlearn everything. It was difficult to get your steps and expressions right at the same time. When my sister asked me to teach her a few steps, she gave up and told me, “I am not an actor and I don’t need to work this hard.” And of course, to match Dhanush sir’s energy (was hard)! Which is your favourite Prabhu Deva dance? First thing that comes to my mind is 'Pettah Rap' and 'Mukkala Mukkabala' (Kadhalan). I also liked 'Gulebagavali'. How does he brief the dancers? It’s about trying to understand what he is saying and surrendering. He doesn’t go by the beats, it’s more '1, 2, ½ and turn'. It was difficult. I was in first grade. In third grade, I came first in a competition. That appreciation felt nice. I just wanted to be the best in Coimbatore and that’s why entered the Prabhu Deva reality show. But the judge’s criticism never hindered my spirits. I was just having fun. I never danced to win. If you were to name some films that made a huge impact on you then and now? Bohemian Rhapsody was impeccable, especially the actor. When he won the Oscar, I felt like I won it. As a child, Kannathil Muthamittal disturbed me a lot. I also remember asking my mother whether I was adopted. Kumbalangi Nights was awesome, and I went through a multitude of emotions (while watching it). Have you set boundaries as an actor? I wear shorts at home, but I am not comfortable wearing it for a film. I am not okay with being objectified on screen, when they talk about my hips and legs and choose to overlook how well I tried to do a scene right, I am not okay with it. Thankfully, directors have been understanding. I won’t endorse beauty products. You need to be confident about who you are. Makeup alone doesn’t make you pretty. I am told that I look like another person when I wear makeup. So surprisingly, most directors insist on a no makeup look for me. It’s a very liberating feeling to be accepted as you are. What’s your idea of a liberated workplace? If I am part of the discussions, if my opinions are taken seriously, there’s nothing like it.